See below for a list of frequently asked questions and answers. If you still don’t see what you’re looking for, please feel free to contact the City’s program consultants for Customer Support. What is the Newton Power Choice program? Newton Power Choice is a municipal electricity aggregation, a form of group electricity purchasing. They deliver your electricity (Massachusetts electric utilities are electricity delivery companies only). Delivery services appear on your bill as Delivery charges. They also supply your electricity, which means they buy electricity for you and pass the cost along to you. The cost of the electricity they buy for you appears on your bill as Supply charges. Your utility can do it for you, as just described. This is called Basic Service, and this is how most people buy their electricity. You can sign a contract with an electricity supplier yourself. You may have received offers in the mail or over the phone. Your municipal government can sign a contract with an electricity supplier on your behalf. This third option is municipal electricity aggregation, and this is what the Newton Power Choice program is. Newton has signed a contract with Direct Energy. What is a municipal electricity aggregation? A municipal electricity aggregation, such as the Newton Power Choice program, is a group purchasing program for electricity. In an aggregation, the City uses the bulk purchasing power of the entire community to select an electricity supplier and to negotiate both the amount of renewable energy that is purchased on behalf of the community as well as the price. If you participate in Newton Power Choice, Eversource will continue to deliver your electricity, but Direct Energy will appear on your Eversource bill as your electricity supplier. Also, the Newton Power Choice price will be used to calculate the Supply charges on your Eversource electric bill instead of Eversource’s Basic Service price. Newton Power Choice provides an alternative both to Eversource’s Basic Service pricing and to other electricity supply offers in the marketplace. What will change with this program? On the Supply portion of your Eversource electric bill, you will see Direct Energy listed as your electricity supplier instead of Eversource. The price that is used to calculate the Supply portion of your Eversource bill will change from Eversource’s Basic Service price to the price for the program option you are enrolled in. Additionally, the amount of renewable energy purchased on your behalf may change, depending on which program option you choose. Otherwise, everything else will remain the same. You will continue to receive your bill from Eversource, you will continue to pay Eversource, and you will continue to call Eversource if your power goes out. Why is Newton launching this program? The primary goal of Newton Power Choice is to increase the community’s investment in clean electricity while providing Newton electricity customers with a stable electricity price. Massachusetts state law already requires that a minimum amount of renewable energy be purchased for all electricity sold in the state. However, Newton Power Choice will purchase an additional 46% additional renewable energy over and above the state required minimum, for a total of 60% renewable electricity. Why is a stable electricity supply price important? Having a stable price for the supply part of your Eversource electricity bill can protect you from the seasonal price increases that occur when you have Eversource’s Basic Service. When Eversource is your electricity supplier, the price that is used to calculate the supply charges on your Eversource bill changes every 6 months for residential and other small customers, and it changes more frequently for larger commercial customers. Having a stable price for the supply part of your Eversource electricity bill can also provide a predictable alternative to the variable prices offered by some commercial electricity supply offers. Some commercial electricity supply offers will provide a stable price for a few months, but then the price will vary monthly. The Newton Power Choice price is fixed for 22 months from March 2019 through January 2021. When the City signs a new contract and the price changes, the City will announce the new price publicly before it takes effect. You may be automatically enrolled. All Newton electricity customers on Eversource’s Basic Service – meaning most Newton electricity customers – will be automatically enrolled in the program with their March 2019 meter reads and will see program prices on their April 2019 bills. Anyone eligible for automatic enrollment will receive a letter from the City in January 2019 with program details and information about how to opt out. However, If you have your own contract with an electricity supplier (in other words, if you are not on Eversource’s Basic Service), you will not be automatically enrolled in the program. You will be able to join the program by calling the program’s electricity supplier. If you would like to be added to an enrollment waiting list and then called back once the program’s electricity supplier is fully engaged, please contact customer support. What is the difference between Eversource and an electricity supplier? Eversource is Newton’s electric utility. They are your electricity delivery company. That means Eversource is responsible for delivering electricity to you, for maintaining the poles and wires, and for addressing power outages. Eversource charges you for these services on the Delivery portion of your electricity bill. Eversource does not generate electricity. An electricity supplier is a company that buys electricity for you from electricity generators or from electricity brokers. For most electricity customers, their utility is also their electricity supplier. When they are your supplier (i.e., when you are on Eversource’s Basic Service), your electricity bill will indicate that is the case. You may also choose your own electricity supplier. If you do, the name of that company will appear on your Eversource bill as your electricity supplier, and the rate you negotiated with them will be used to calculate the Supply charges on your bill. In Newton Power Choice, the City chooses an electricity supplier on your behalf. Newton has signed a contract with Direct Energy to supply electricity to the City. Direct Energy will appear on your Eversource bill as your electricity supplier, and the rate the City has secured from with them will be used to calculate the Supply charges on your bill. What is the minimum amount of renewable energy in electricity required by state law? The minimum amount increases every year. For 2019, Massachusetts state law requires that renewable electricity must be purchased from renewable energy projects in New England to match 14% of your electricity use. In addition, state law requires the purchase of a minimum amount of renewable energy from older renewable energy projects in New England, as well as from some other energy sources that are considered highly efficient but not renewable. For more information, visit the Massachusetts Department of Energy Resources page on compliance information for the Renewable Portfolio Standard. Why should I opt up to 100% renewable electricity? The 100% Green option purchases renewable electricity to match 100% of your electricity use, all from renewable energy projects in New England. Choosing this option means making the most significant contribution possible in the program to sustainability and to the New England economy. Reducing Newton’s greenhouse gas emissions by increasing the amount of renewable energy used to generate electricity. Electricity generated from renewable sources, such as the sun and wind, does not create the greenhouse gases that cause climate change and does not pollute the air. Encouraging the development of additional local renewable energy projects by creating additional demand for the electricity generated by those projects. Supporting local businesses and local jobs by buying electricity from New England-based projects. I received a call/visit/letter in the mail about my electric bill. Is it from the City or this program? Newton Power Choice will send out one letter about the program just before program launch. 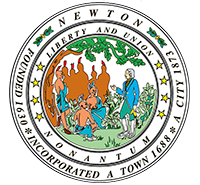 That letter will include the Newton Power Choice logo, the City seal, and the Mayor’s name at the bottom. If the letter you received does not include all three items, it is not from the City and does not represent the City program. Please note that if Eversource is your electricity supplier and you receive a letter about the program in the mail, you will be automatically enrolled in the program unless you choose to opt out. You do not need to provide additional information to participate. Any person or company who asks for additional information when they market their program to you does not represent Newton Power Choice. Does this program replace Eversource as my electric utility? No. Eversource will remain the electric utility for Newton and will continue to deliver your electricity, and your primary relationship for electricity will remain with Eversource. Newton Power Choice will change the supplier on your Eversource bill to Direct Energy, and it will change the rate that is used to calculate the Supply charges on your Eversource bill. But your bill will continue to come from Eversource, and Eversource will continue to be your electric utility. What will my electricity supply price be through the program? The Standard Offering is the default program offering. You will be enrolled in the Standard Offering unless you request one of the other options. From March 2019 until July 2019, when the Eversource Basic Service price changes, these prices compare to a Basic Service price of 13.704 ¢/kWh (14% renewable electricity). This means that when this program goes into effect in March 2019, a typical Newton electricity customer (who uses 710 kwh/month) will pay $165.89 per month, and that’s including the 60% renewable energy. That’s $16.48 per month less than that same customer would pay on Eversource’s winter Basic Service rate, with only 14% renewable power. Under Newton Power Choice, customers can opt up to 100% renewable energy for an additional $2.91 per month, i.e., on top of the $165.89, which is still less than the Eversource Basic Service price. Or they can opt down to the 14% state renewables requirement and save $3.34 per month, paying $19.82 less than Basic Service. Newton’s electricity contract price will remain fixed for 22 months, while Eversource’s Basic Service rate for residential customers changes every six months. For that reason, it’s not possible to say for sure that the cost savings under Newton Power Choice relative to Basic Service will last for the entire 22 months. However, if Eversource’s Basic Service actually becomes less expensive than Newton Power Choice at any point, customers can return to Basic Service with no fee, making the program an absolutely no-lose proposition for Newton customers. Will I know the program price and the price of each program option before I am enrolled? Yes. If you are an Eversource Basic Service customer, you will receive a letter in the mail with program information, including pricing, before being enrolled. The letter will include program price information as well as Eversource’s current Basic Service prices. Note that you cannot know the Eversource Basic Service price beyond the current 6-month period for which Eversource purchases Basic Service Supply. The program itself will last as long as the contract for electricity supply that the City enters into. The current contract with Direct Energy extends until January 2021. At that point, the City can continue the program by signing a new electricity supply contract, or it can end the program and return all participants to Eversource’s Basic Service. The City’s intention is to continue the program, but the City will make an announcement about its decision either way at that time. All program participants have the right to opt out of the program at any time with no fee or penalty. No. Participation is not required. There is no penalty for opting out. You may do so at any time. You may opt out of the program before being enrolled, and you may opt out any time after enrollment. If you opt out, the supply portion of your bill will remain on Eversource’s Basic Service rate. Yes. If you have already chosen an electricity supplier, you will not automatically be enrolled. However, you will be able to join the program by calling the program’s electricity supplier. If you would like to be added to an enrollment waiting list and then called back once the program’s electricity supplier is fully engaged, please contact customer support. No. Eversource will continue to bill you for your electricity, and this is the only electricity bill you will receive as a participant in Newton Power Choice. My organization is tax exempt. How do I maintain its tax exempt status in this program? Direct Energy is required to have tax exemption documentation on file for every electricity account that participates in the Newton Power Choice and has tax exempt status. Without that documentation on file, Direct Energy may be required to charge tax on the account. They cannot obtain that documentation from Eversource. They must obtain it from each customer directly. No. Eversource’s quality of service to you will be unaffected by your participation in Newton Power Choice. Eversource does not profit from the supply charges on your electric bill. They make their profit from delivery charges. As a result, they have no preference whether they choose your electricity supplier or Newton does. The Newton Power Choice price is fixed until January 2021. However, Eversource’s Basic Service prices change every 6 months for residential and small business customers, and every 3 months for medium and large business customers. As a result, it is likely that for some months, the Eversource price will fall below the price of the Newton Power Choice program Standard Offering. Newton Power Choice cannot guarantee that it will beat Eversource’s Basic Service price at all times, or even the average Eversource price. The program goal is to beat the average of the changing Eversource prices, although there is no guarantee that it will do so. Program participants are free to opt out at any time and return to Eversource’s Basic Service. I am currently eligible for the low-income rate from Eversource. Will this change? No. If you are eligible for a low-income discount from Eversource, it will be unaffected by your participation in the program. Yes. Budget billing is a service from Eversource in which your bill is the same amount every month, regardless of how much electricity you use. If you participate in Newton Power Choice, budget billing will no longer apply to the Supply portion of your Eversource bill. If paying exactly the same amount every month is important to you, you should opt out of the program. Information about how to opt out will be made available in January. Is Newton the only community in Massachusetts implementing this kind of program? No. Municipal electricity aggregation has been building momentum across Massachusetts. Newton will join more than 140 other Massachusetts communities that already have aggregations. Recently, these communities have been implementing “green” aggregations like the Newton program, which increase the amount of renewable electricity in the community’s electricity supply beyond the minimum amount that Eversource is required by state law to purchase.